Your business is growing. Your employees expect to be paid. You’re having a hard time keeping up. It isn’t easy managing a business, and at some point, you or the CFO of the company needs to seriously consider where you can save money and improve operational efficiency with your payroll. Many businesses choose to manage their payroll operations and functions internally, spending time, money, and resources on manual bookkeeping, in-house bookkeeping, or complicated payroll software. The choice to keep payroll in-house is costing businesses across the nation upwards of $6 billion each year in IRS employer payroll penalties. What does this mean for you and your business? Outsourcing your payroll is a smart move to save money and time. At Limitless Investment & Capital, we understand if you want to keep payroll in-house. You have more control, and you can manage the process. But do you know how much it’s costing you to pay for a payroll department? As your business grows, you will need to hire and train a payroll department, which can be extremely expensive for your company. And, if your payroll department does not keep up with operations and laws, rules, and regulations, it could cost you even more in penalties from the IRS. When you outsource your payroll, you save money, time, and the headache of penalties. You’re growing a business. You need to be focused on where the business is going, not how people are getting paid. You’ve heard the phrase before, but it’s imperative as a business owner to delegate responsibilities. Most owners plan on doing just that, but as the business grows, the payroll records and intricacies grow deeper, which creates resistance in passing it off to a business solutions company that offers payroll services. You divert talent and skill away from the main business focus when you keep payroll in-house. One of the biggest reasons the IRS issued upwards of $6 billion in penalties in the 2016 fiscal year was due to non-compliance as it related to employer payroll obligations. If you do not want to be one of the companies that owe penalties to the IRS, it’s time to outsource your payroll and trust a company that offers excellent payroll services to fit your needs. You save money when you outsource your payroll. Processing payroll data and information is a risky task. Identity theft and embezzlement are some common occurrences for in-house payroll departments. You have to ask yourself: how safe is the payroll data being processed through your payroll software right now? The cost of a lawsuit or potential breach is astronomical compared to outsourcing your payroll with the guarantee that you will have a clean, smooth payroll operation process. You protect your employees’ personal data and information when you outsource payroll operations. 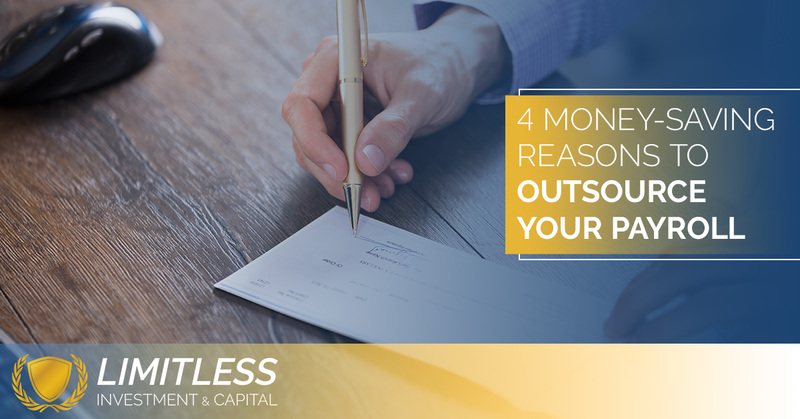 As you grow your business, consider the money, time, and sanity you can save when you outsource your payroll operations. Limitless Investment & Capital is here to help you analyze your internal control processes and assess quality and effectiveness of your operations, offering payroll services that save you money and time. Contact us today for an internal audit and free consultation!